I saw over at Woo Themes that they have recently released the Irresistible premium WordPress theme for FREE. 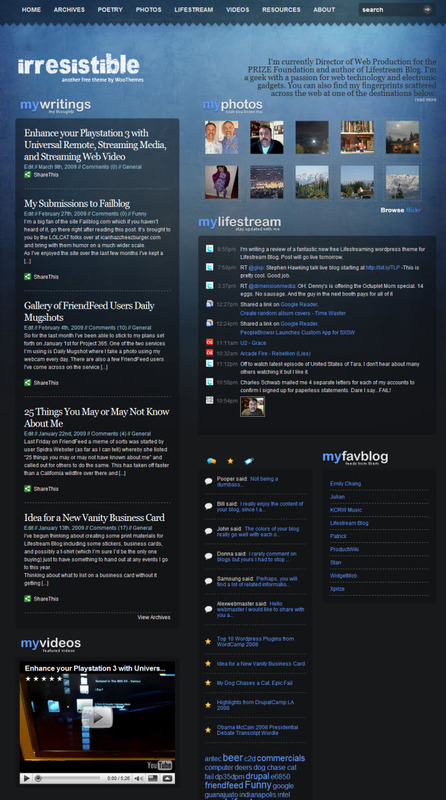 This theme took 4th place of the top 10 themes selected from a contest that Woo Themes ran last year. The designer, Izuddin Helmi also won 1st place with another submission. This theme caught my eye very quickly as it is both styled and has functionality specifically catered to a Lifestreamer. I thought this theme looked so great that I had to try it out and write a review. Before I get into the details take a look at the screenshot of the theme below after I installed it and plugged in all my data. Not sure you feel the same way I do, but this theme struck me immediately as being really nice visually and breaking out the content in a unique way that I really hadn’t seen before. I feel it’s a clean fresh look that works well to bring your Lifestream to a blog. The image above shows the custom homepage option which provides small excerpts from blog posts and includes the Lifestreaming components. There is also another traditional homepage you can set it to use that displays full posts with images and utilizes a standard single sidebar on the right. So now I’ll get into the setup and options. After copying over the theme and selecting it you have several things you need to configure to get your homepage and content setup properly. There is a dedicated options page to make this a pretty simple process. The myPhotos section is pulled in by providing your Flickr user account information. Flickr appears to be the only service supported for this section. myLifestream requires that you install and configure the great Lifestream WordPress plugin by David Cramer available here. You have the ability to set the number of items you want displayed on the homepage for blog posts, photos, and Lifestream items. The myVideos section has a unique way of pulling in your latest videos. Simply create a new post and copy the embed code into a custom field that is added by the theme and then simply use the tag video which sets a flag for it to be placed on the homepage. Unlike photos, you don’t have to define a specific service and it appears to support many different video services. As if that wasn’t enough you also get the full PSD file that has an extensive breakdown of all elements used so you can customize the design even further if you wish to. I have to say that this is the most impressive Lifestreaming theme I have seen or WordPress yet and I’m tempted to use it for my personal site despite the fact I just spent a ton of time customizing another one I switched to recently. I highly recommend taking a look and tinkering with this theme to see if it may be right for you. You can get all the details and download the Irresistible theme on the Woo Themes site here and get a live demo here. Thanks, Mark….great write-up, this is a tremendous offering from Lifestream! Micki Krimmel is using it! I'm using this theme as well at http://mickipedia.com. I'm having trouble with the lifestream plugin which came with the theme. I'm getting errors every time I try to add my twitter feed. Did you install the plugin independently of the theme? I'm thinking of deactivating it and reinstalling to see if a fresh install of the plugin will fix the bugs. Hmm, I was already using the LIfestream plugin prior to adding this theme. I also just looked at the zip file from the theme and didn't see it included. I haven't had an issue importing my Twitter account. I would recommend getting the latest version of the Lifestream plugin from here and then re-installing it. There is also a support forum available for the plugin where you may be able to get help on any issues. I am really REALLY tempted to switch to this theme. It's definitely what I've been looking for and I'm pretty sure I could hack in FriendFeed support as an option…maybe even support a different photo service (I'm not that into Flickr). Yea, as I said I'm tempted to move to this as well. I'm sure replacing the Lifestream plugin block with FriendFeed wouldn't be too hard. I'd also like to move the video block to the upper right as well. I might tinker with this after I get back from SXSW. hey nice tutorial/review. but how do i get into the dedicated option page? when i uploaded the whole folder to the themes folder i get a totally different outlook. Glad to see Lifestream getting more and more support! I really like the idea of including the plugin in theme designs, and it's a great starting with WooThemes. However, I wanted to make one comment, which bothered us a bit. The Irreistable theme from WooThemes has some not-very-nice CSS included by default, which forces your page to hide Lifestream credits (which are opt-in only) as well as the date headers. I would have preferred to see them as an option rather than putting this on the user without a choice. Please see this post, http://www.ibegin.com/labs/forums/index.php?top…, for the lines which cause the problems. Thanks for providing this info David. Perhaps you can contact Woo about having the author provide a fix. I too love seeing your plugin getting wider support. Thanks for providing us such a great Lifestreaming plugin for WordPress! My guess is that you are not running version 2.7 of WordPress. They revamped the navigation so that's why it may not be displaying the same way for you. This theme is amazing and I want to use it so bad. I am currently using one theme but I just don't like it anymore. When I go to install irresistible I get this error Fatal error: Cannot redeclare wp_pagenavi() in /home/scottfor/public_html/blog/wp-content/themes/irresistible/functions/admin-setup.php on line 162. How can I fix this? I decided to google the theme a bit before paying the 40/yr for theme support. I ended up coming across a comment that mentioned serious IE7 issues. I checked it myself and it puts the right sidebar on the bottom of the blog content. Hmm, I just tried it using both the regular and custom home page and couldn't duplicate the issue. Strange. Sorry Scott. I have no idea on that one. Well, that's unfortunate. They could at least have credited you in the footer. Any idea how to get the tabs section (containing posts, comments, tagcloud) to actually work as switchable tabs? Similar to the picture above, the entire section on mine just scrolls down rather than staying hidden until clicked. Thanks Mark for discovering this gem ! Nice work on porting this over. I'm sure many users will be very happy you did. Thanks for the little tut. Now i finally have the video working! How do you get the MyPhotos to show up in the sidebar on a blog post page? Even after almost a year, your post saved me! Thanks so much! Thank you so much for your help. : ) I was lost as to how to get photos up and you were the only helpful site I found. Sadly they no longer offer this theme. A shame as it looked ideal.